So Smart! Why Didn’t I Think of That?? Don’t you love these clever, brilliant, and simple tricks to manage our time and teach us a few new tricks? I have been collecting these for years and will be adding more here. Better, cheaper and faster… these 8 homemade lawn and pest remedies are good! Make a homemade mosquito trap from a soda bottle- click here to learn how to do this. 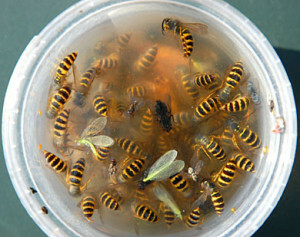 Recipe for a Homemade Wasp Trap using vinegar, sugar, and salt. Thank you to CompleteGarden for your tutorial! Try sprinkling cinnamon in the sandbox to repel the little bugs that like to play too. Test your child for sensitivity first. As an added bonus, they might come out smelling like a little cinnamon roll! From DoItYourself.com. Keep pests out of your garden with a mixture of coffee grounds and orange peels. This works for cats too who might want to use your garden as a litter box. Today’s useful tip is from All You Magazine. Do you have summer clothes that you did not wear? Once or twice a year, remove everything from your closets. Wipe down the walls and baseboards and vacuum the floor. Turn all your hangars the wrong way and after you wear an item, rehang it in the opposite direction. Consider donating the items after 6 months if you have not worn them. Tack up a pool noodle to your garage wall where you park to avoid those door dings! This useful tip was found on Pinterest here. Cleaning a water stain off a wood surface is today’s useful tip from TLC “Green Home Cleaning Tips“. You can quickly get rid of the water mark by making a thin paste of salad oil or lemon oil and salt. Wipe the paste on, then lightly buff the area as you wipe it off with a soft cloth. 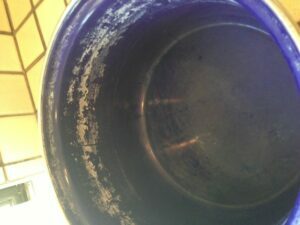 My blue pot full of mineral deposits before soaking it in vinegar. A quick soak in vinegar and a little scrubbing with a rough sponge. Pretty nice! 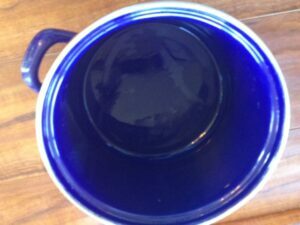 Household Uses for Leftover Coffee and Tea – I found several new ideas, read my post here. What do you do with leftover coffee and tea? Great tips and resources from Q-tips,Associated Content, The Beauty Bunny, Beauty with Brains,Lifehackery, and Smarty Pants. You may want to bookmark this page as I will be adding even more shortcuts, DIY’s and Life hacks to make life a little easier! Please share this with your friends and share your favorite ones with all of us! Do you have a tip to share with everyone? I would love to add your life hacks and shortcuts to this growing list!